Jeffrey Miller has spent the last two decades flitting around Asia as a university lecturer and writer, including a six-year stint as a feature writer for The Korea Times, South Korea's oldest English-language newspaper. Originally from LaSalle, Illinois, he relocated to South Korea in 1990 where he nurtured a love for spicy Korean food, Buddhist temples, and East Asian History. He divides his time between South Korea and Laos, where his wife Aon, and three sons Bia, Jeremy Aaron, and Joseph reside. 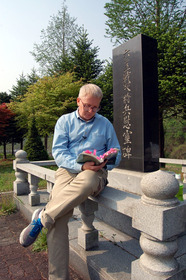 He's the author of four books, including the award-winning War Remains, a Korean War Novel based on articles he wrote about Korean War Commemorative events from 2000-2003 for The Korea Times. It all comes down to, "the unexamined life is not worth living." Hi Jeffrey! Welcome to Fictionaut. How's the life in Asia at the moment? Thanks, Jeffrey, for your nice comments on Weakest Link. Thanks, Jeffrey! I really appreciate your comment on "Greyhound." Thanks so much, Jeffrey, for your nice comments. Much appreciated. Looking forward to reading more of your work. You must log in to write on Jeffrey Miller's wall.